Deborah Jordan Brooks is the author of He Runs, She Runs: Why Gender Stereotypes Do Not Harm Women Candidates. She is an associate professor of government at Dartmouth College. 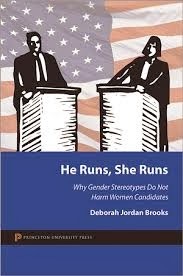 Q: Your book challenges the idea that gender stereotypes are harmful to women candidates. Why has that idea become entrenched, and why do you disagree with it? A: I suspect that a major reason that the conventional wisdom persists is that people observe gender dynamics in their workplaces and in their social lives, and they may see a fair number of situations where potentially powerful women seem to have some kind of disadvantage. It might seem logical to think that similar dynamics would exist in politics. For example, anecdotes abound – and academic research generally supports – the idea that women business leaders, especially women in male-dominated industries, have to be tough to be taken seriously; however, when they act tough, women are the more likely to be disliked. It doesn’t seem like much of leap to assume that women might face a similar double bind in politics. But business leaders are generally expected to perform very different functions than politicians, and they also tend to be much closer to their evaluators in a manner that might make people’s expectations more gendered. After all, you might expect something different out of a boss you will see every day and who will be evaluating you, versus a politician you are unlikely to ever even meet. To the extent that powerful women may be at a disadvantage in the business world and/or social life, I just do not find any evidence that it is occurring in politics. There are other reasons, too, that the conventional wisdom exists. For one thing, it is possible that women candidates were actually at a disadvantage in politics in the not-so-distant past, and people haven’t updated their beliefs on that in the more recent era. But another thing to keep an eye on is that there may be some political players who have a financial interest in promoting the idea that women are at a disadvantage. After all, a woman candidate who is told she needs extra help because she is at a disadvantage may spend more on some of the services that political consultants can provide; moreover, potential campaign donors who are told that women candidates are at a disadvantage may potentially be more willing to open their wallets for particular candidates or political causes. As academic evidence mounts with findings that the public is quite equitable towards male and female candidates, it may be quite interesting to watch who is most vocal about insisting that it is not the case, and the basis on which they are making those claims. Q: You write, "Many potential women candidates believe that they need better qualifications than men to have a chance at winning a campaign. This study shows that those perceptions are quite clearly wrong." What does your study show instead? Research by others has found that potential women candidates cling to the idea that women have to be better than men – “twice as good” is a common mantra – to win elections. And political commentators often perpetuate this belief, arguing that a male candidate would not be questioned for something (lack of credentials, lack of experience, etc.) that is perceived as a weakness for a woman candidate. If true, that could have been a big problem for women in politics. Yet my research shows that male candidates suffer somewhat more from political inexperience in a few specific ways than women candidates. It was one of the very few instances in my entire study where I found that the public was harder on candidates of one gender than on the other, and it was exactly counter to conventional expectations (more precisely, people were not more or less likely to support the inexperienced woman candidate overall, but they rated the woman more highly on some specific characteristics). Looking beneath the surface, it turns out that people are viewing the inexperienced woman as an outsider, and giving her some positive credit for that, with relatively higher ratings for the woman on characteristics like “Honest,” and “Will improve things in Washington.” The inexperienced male candidate does not get that “outsider bump,” perhaps because he is assumed to be similar to the bulk of politicians already in office. The bottom line is that this shows we cannot explain the dearth of women in office by saying that it is because they have to be better than men to win. There is no evidence that is true. Q: One of your chapters deals with candidates crying or displaying anger. How do those behaviors affect attitudes toward both male and female politicians, and does it differ? A: My results are unequivocal that candidates should do everything they can to avoid angry outbursts while on the campaign trail. That is not surprising. What is interesting is that, despite ample speculation to the contrary by the media and others, it is no worse for a woman candidate to blow her top than a man. They will both be equally in trouble with the public if they cannot contain their anger. The act of crying is more interesting because it involves more nuanced dynamics. Many readers will recall the flurry of media speculation at the time of Hillary Clinton’s “emotional moment” on the day before the 2008 New Hampshire primary. At the time, many pundits speculated that women cannot cry on the campaign trail without losing public support. But, despite the footage of her misty-eyed discussion with a group of women voters, Clinton went on to a surprise victory in the New Hampshire primary. Many wondered if there was a connection, even though it was counter to the conventional wisdom: women politicians should not show emotion or they will get penalized for it far more than men. My results do not suggest that women politicians fare any differently than men with the public when they cry, and that crying only has a fairly modest depressive effect overall on public opinion anyway. But that does not mean that Clinton did not benefit to some extent from that incident. Crying tends to take a toll on the attributes that Clinton had already hit home with voters (strong leadership, ability to handle an international crisis, etc. ), and it can actually help candidates with the particular dimensions on which she was having the most trouble (honesty, compassion, caring, etc.). As such, Clinton’s “emotional moment” may have improved the public’s views of her, but it would not have been because she was a woman. It was because tears seem to be able to help tough candidates connect with voters at an emotional level, regardless of whether the candidate is a man or a woman. Q: What do you see as the outlook for women candidates? A: For any given woman who chooses to run for office, my research would suggest that she will do at least as well as a comparable man in winning over the public. So the outlook, at least among those who run, is good. Gender will not hold a woman back from successfully wooing the populace. If it is not discrimination by the public, why aren’t there more women in office, then? And why haven’t we had a woman president yet? Based on the research to date, common alternative explanations do not seem to pencil out. The evidence about the media’s treatment of women candidates is very mixed; it is unlikely that the explanation rests there. It is not that women are at a disadvantage with campaign donors. It is not that women are running and winning now but there just aren’t enough open seats. Those cannot tell us why there are not more women in office. The problem that stands out is that women do not run for office. Other scholars have found that women do not have nearly as much confidence as men that they can win, even when their actual qualifications are equal. And it is no wonder that women do not have confidence, since people genuinely believe that it is much harder for women than men to win over the public. It would actually be quite rational for women to opt out of running for office if it that really were true! But my study shows that perception is not accurate. Women with leadership potential, and the people who might otherwise encourage them to run for office, need to realize that they are not at a disadvantage in American politics. Otherwise, the balance of women in politics may not improve much, even with a level playing field. I am a public opinion researcher at heart, and my work always tends to focus on issues pertaining to public views politics and politicians. For some of my ongoing research, the dimension of primary interest is still gender. I have a couple of ongoing projects still in that domain (one pertaining to women as political donors, and another that looks at how people react to the physical presence of men versus women candidates). I am also looking into when the public will, and will not, support going into conflicts with other countries. I started that work with a co-authored article on whether the conventional wisdom that women are “doves” and men are “hawks” was correct, and we found that it was decisively inaccurate for some kinds of wars. My work on that has now moved to other questions pertaining to war support that have to do with differences between people that go beyond gender. Remember to talk to your children about politics as much as possible! As future voters, and as potential candidates, more girls – and more boys, for that matter – would benefit from an early immersion in politics and political issues. Take your children, or take your nieces and nephews, to the voting booth with you on Election Day. Talk to kids about candidates, and the process of running for office. Discuss political news with them, and encourage political debate around the dinner table. Help them feel comfortable with the idea that political disagreement is an important part of the political process. Besides potentially livening up the dinner table conversation at home, children who get an early immersion in political issues will tend to end up being more active and involved citizens in the long run. And that is good all around.